Late yesterday afternoon, I headed to Penn Station from Long Island under gray clouds. I was surrounded on the LIRR by numerous Rangers fans in various sweaters. When the season began, I was feeling a sense of withdrawal watching the Rangers playing overseas and starting on the road for the first couple of weeks. Finally, the Rangers came home. I kept thinking of my old section, the rut in the concrete floor in front of my seat. It was comforting the same way the den in my childhood home was. I was missing that seat. intros were listless -- just like the team. I arrived at Penn Station, but I was not going to the Garden. I had an appointment elsewhere. Like many of my friends, I had not renewed my seats this year. It was a difficult decision, but not necessarily permanent. A cold driving rain greeted me on 7th Avenue and that's when I really started to miss being inside the Garden sitting at my comfortable seat, rut and all. 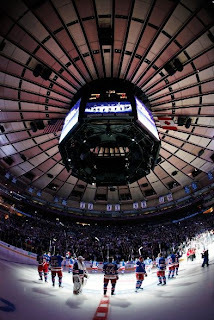 Despite the nostalgia, I have been ambivalent about the Rangers since training camp opened. After last night's effort, a depressing 4-2 loss to the Toronto Maple Leafs, I can see my ambivalence so far has been validated. The official recap is here. Last night the so far surprising and youthful Maple Leafs came to christen the new Garden. Michael Sauer and Wotjek Wolski joined the Rangers squad after missing most of the season due to injuries. 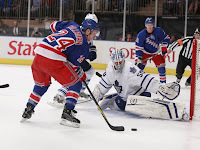 Within the first 6 1/2 minutes of the game, Dan Girardi got the Rangers off to an early lead with a shot from the right point that simply eluded Jonas Gustavsson, who was replacing usual starter James Reimer, out with an injury. It was a typical bad goal given up by the mediocre goalie. 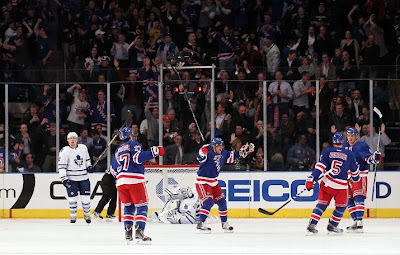 Rangers celebrate their first goal and first lead of their home season. Immediately, visions of the sieve that Gustavsson was last year during last year's Gaborik led 7-0 rampage were obviously dancing in fans' heads. And the Rangers looked like they were going to pounce. The Rangers pressured throughout the first period and even scored twice but each time the goal was waved off due to incidental contact in the crease between Ryan Callahan and Gustavvson. So two terrific shots by Dubinsky and Del Zotto were nullified. Meanwhile, Marian Gaborik was buzzing around the ice taking advantage of his speed to get good chances. 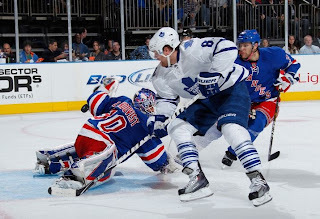 On one rush, he split the defenders and took aim at Gustavsson before being stopped. His speed has been one of the bright spots so far. The Rangers had 16 shots in the first period, nearly matching their game average of 22 so far this season. But at the end of the period, the Rangers only had a 1-0 lead. he was called for being in the crease twice to nullify goals during the first period. In the first 80 seconds of the second period, Matt Lombardi found an opening between the goal post, Henrik Lundqvist's arm and his side to slip a puck into the net to tie the game at 1. Phil Kessel roamed the ice at will wreaking havoc. twice on breakaways during the second period. 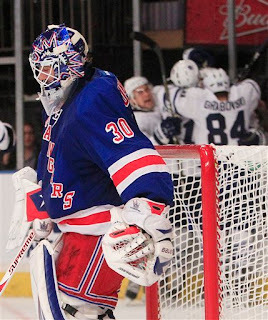 The Ranger defense scrambled to keep the puck out of the net as Henrik was forced to track Leaf players all around the net. In fact, for the next 30+ minutes of the game, the Rangers would muster a pitiful 7 shots on goal and were behind 4-1 with 4 minutes to go. During that span, the Rangers were out shot 23-7. Gustavsson, shaky in the first period, was given a reprieve as the Leafs provided what Tortorella wants -- the best defense is keeping your team pressuring in the other end. Then in a final burst,the Rangers would score after shooting 7 pucks at Gustavsson in the waning minutes. One of those nights. Lundqvist had a shaky 3rd period. But he also had no support after the first period. Although there was no further scoring in the second period, the Rangers were obviously being dominated as they could not set up any attack in the Leafs zone. In the third period, Henke was beaten 3 times. While he was not as sharp as he had been in previous games, he had kept the team in the game during the 2nd period when he made 15 saves. Unfortunately, the 3rd period was the worst period he has had the entire season so far and he was not picked up by his team. The first Leaf goal came from a scramble in front of the net when Joffrey Lupul was able to poke the puck past Henrik's left side at the 2:11 mark. 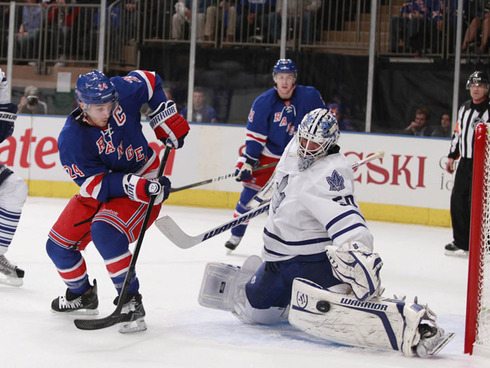 For 2 straight periods, the Rangers yielded a goal within the first couple of minutes. The back breaking goal came 4 minutes later. As an onrushing Artem Anisimov headed into the Leafs' Zone, Mike Komisarek poked the puck away and slipped it between his legs to Clarke MacArthur who spun on a dime, headed up the left side over the blue line and blasted a shot from the dot of the left faceoff circle that beat Lundqvist to the far side. 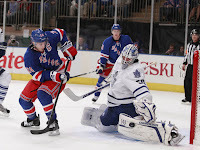 The final Toronto goal was scored by Mike Brown who launched a shot from nearly the same spot to beat the Ranger goaltender. That time, again the Leafs were quick on the transition and Tim Erixson was victimized by Brown at the Ranger blue line with 6:06 remaining. Michael Del Zotto closed out the scoring late in the game. His play has improved the past week. 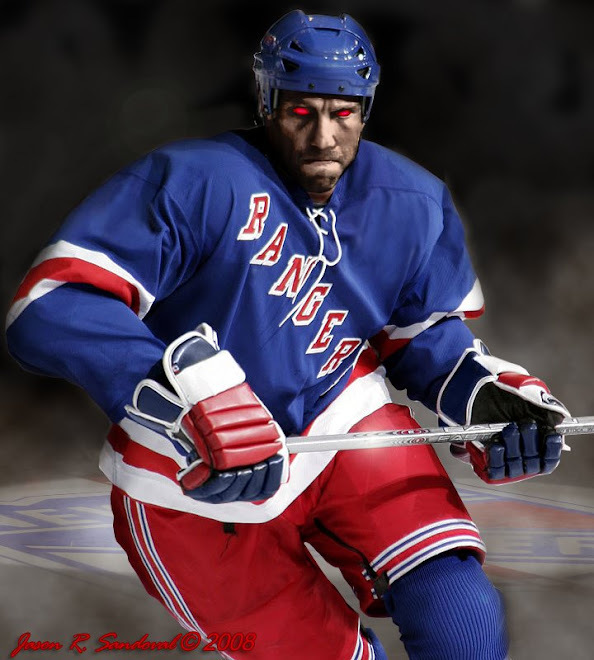 Unfortunately, the Ranger goals only came from their defensemen. 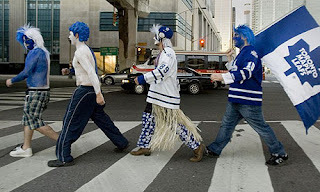 know they would not be around to open the renovated arena. Through these first 8 games (roughly 10% of the season), there has been no spark on the team. There is no personality that charges up the fans and the team -- Vinny Prospal and Sean Avery come to mind as the ones missing. Maybe we just foolishly hoped for continued improvement from the 2009 season to last season to now this season on a scale beyond the players' capabilities. It is possible that Boyle and Prust and Anisimov had career years LAST year. Stepan may be having a sophomore slump but he showed signs of working well with Dubinsky & Callahan. Both of those players have not shown any signs of offensive firepower. Each has a single goal. 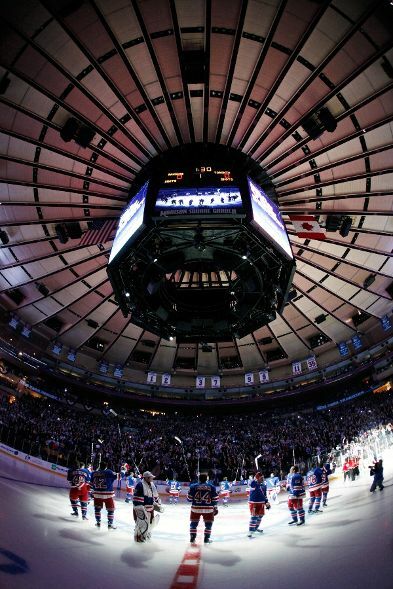 Meanwhile, the Rangers have lost to 2 teams that have some serious scorers -- the Islanders and Maple Leafs. The Caps and Pens are scoring prolifically. You have to be concerned. Still, we won't have answers until mid-to-late December. Patience is the watchword. And that is in short supply among Ranger faithful. That last thought is worrisome. Fans have been getting awfully anxious on the Internet for the past week or so. Folks, this team is not built to win this year. We want them to compete but most of all we want to be entertained. The hue and cry over the missing Sean Avery is no different than the hue and cry over Petr Prucha and other players who had some initial success, won the fans' hearts but ultimately proved not to have staying power. Right now, this season will be about further development of the youngsters (Sauer, Del Zotto and Stepan). Some players are playing for their careers and cannot live on the success of last season (e.g., Boyle, Prust, Anisimov, Dubinsky). They should be looking over their shoulders anyway because a new regime is being groomed in the AHL and minors. Next up -- a Saturday 3 p.m. matinee with the Ottawa Senators.